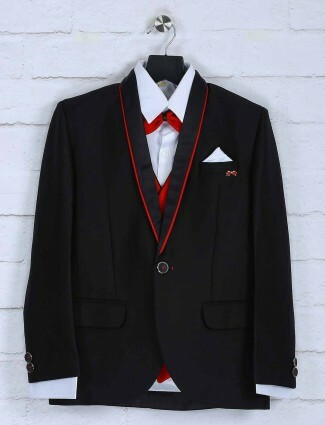 Buy the latest boys coat pant at G3+ fashion to bring a well organised formal dressing for boys. 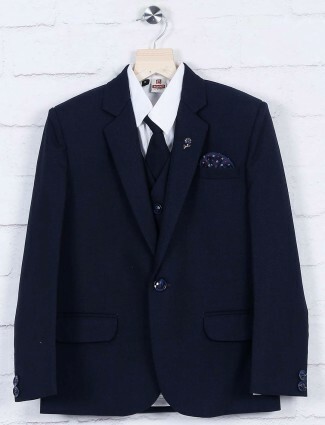 Pick from a wide range of suits for boys in different colours and fabrics like linen, velvet, imported fabrics, Cotton, jamawar, satin, jute, corduroys and others. 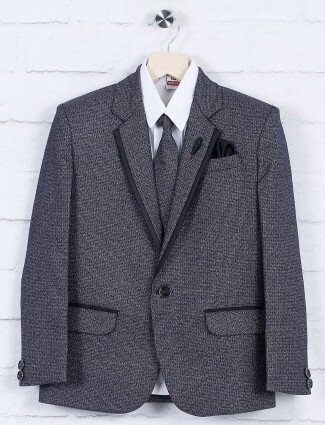 The traditional styles and modern cuts allow the coats to be in splendid styles to fit and suit boys. 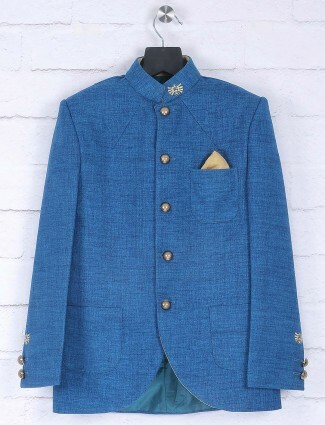 The fabrics in simple solid form or the vintage design woven fabrics used for those coat suits to wear at ethnic desired dress up functions. 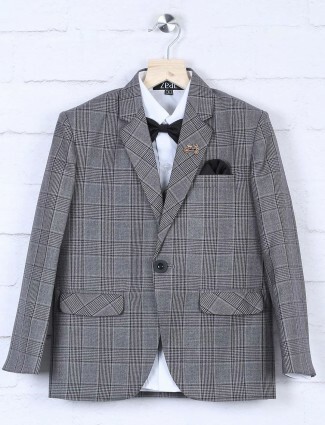 Look different in the new cuts and patterns at G3fashion.com online, you can get beautiful coat suits for boys of different ages. 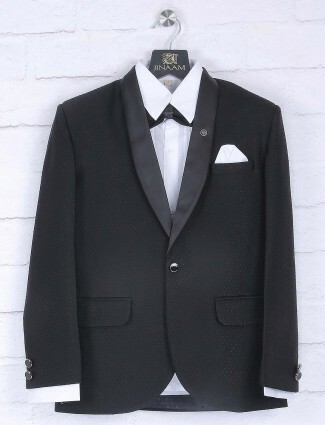 Our collection has boys wedding suits with collar styles to look different in embroideries or in rich fabrics, all look exquisite. 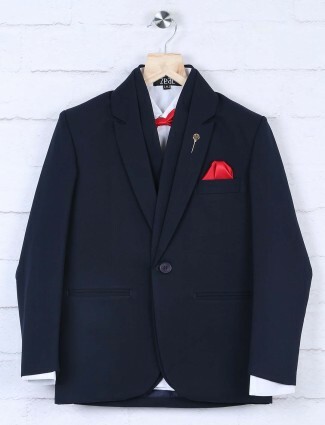 You can now get the latest collection and in affordable range of exclusive designer products, shop online with us to get maximum satisfaction of our services and starting price at INR 1700 to bring a stylish look for your boys at events parties, receptions and weddings in coats suits. 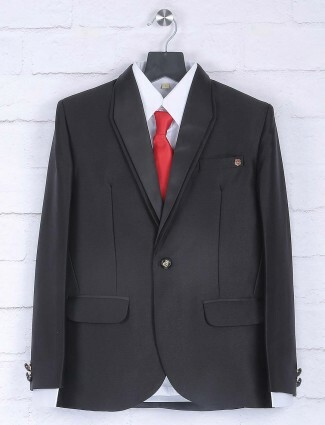 We have boys coats suits in designs from the brand G3+, we design comforting and fashion trendy styles meeting your requirements in black, red, blue, green, grey, purple and others shades. 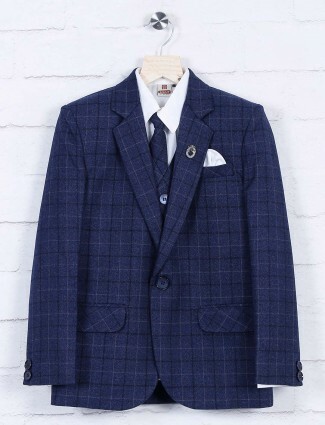 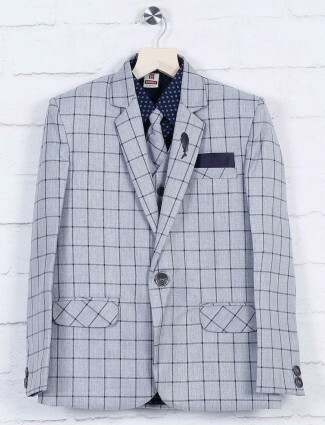 The fashion for occasional and formal dressing, can be attained with new styles of coat suits in the boys wear segment, which are specially made in easing fabrics and patterns to bring more comfort with the whole suiting styles for boys. 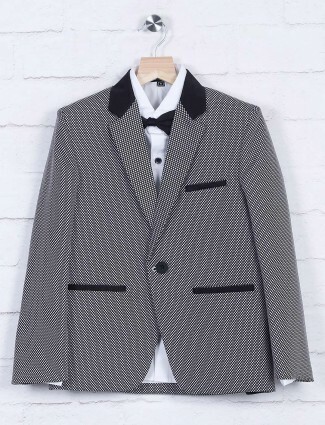 Find them online in all sizes also little boys suits made from different fabric types and patterns as per the season. 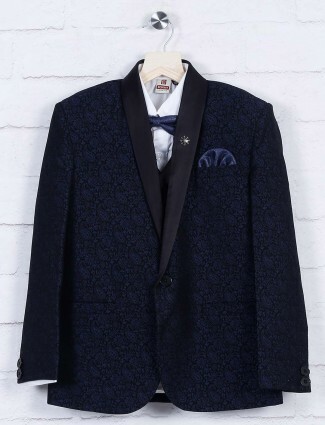 Be from styling your boys at wedding wear to party wear, a coat suit design always comes in handy and get the right impression for the occasion. 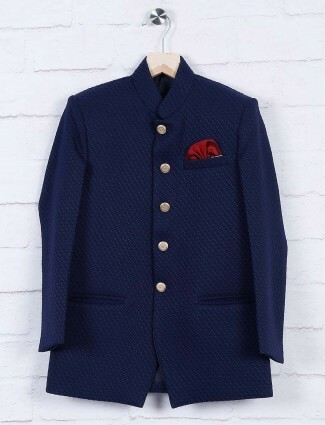 A velvet red coats suit in mandarin collar with low buttons, round hemline cuts paired up with black trousers to bring a fresh ethnic style. 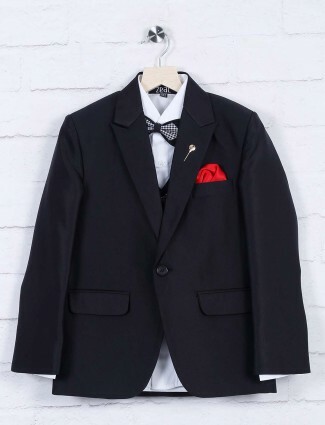 The tuxedo suits styles for little boys, in black and grey imported fabrics bringing the classic fashion in, or the sober linen coat suits in pastels to wear at ceremonial event, which come in flat collar to stand collar patterns. 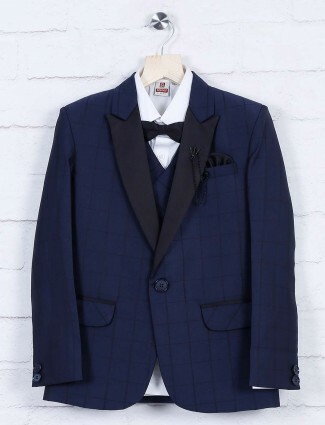 Stars at a event have been seen appearing with their kids, celebrity kids wearing coat suits, a 3 piece suit or a tuxedo suit which brings the classy look. 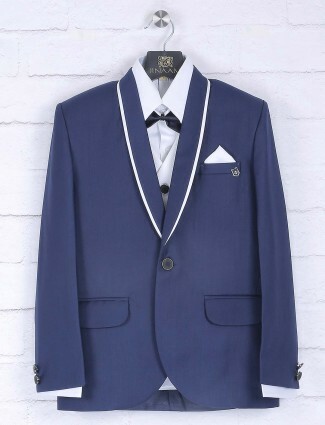 A smart party can have your boys look all grown up with the smart and stunning bright blue and purple coats suits in imported fabric or the velvet boys coat suit in unique cuts and patterns. 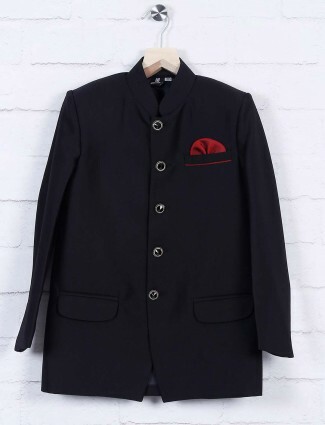 Boys Designer Coat Suits are paired with complimenting bottom wear and styles made in different fabrics and colours as per designer concepts. 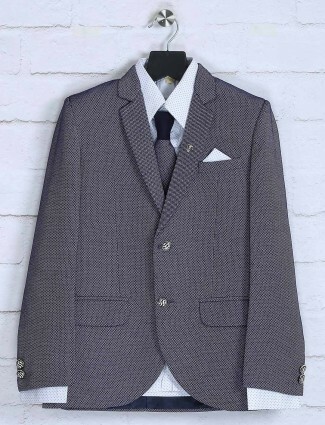 A match of blue and black, or maroon and black, and pastels with white are the basic combos of boys suit. 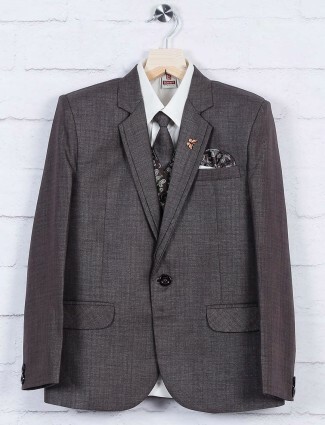 A vintage style of browns and pastels or the monochrome is also a great colour theme for boys wear, and their most favourite the bright hues to get their livelihood expressed in sophisticated styles. 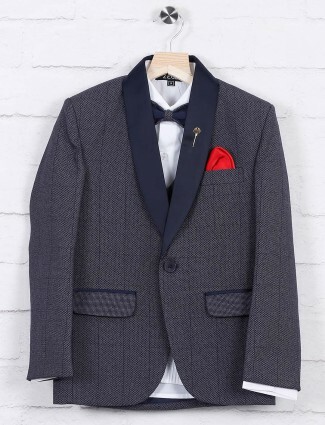 Buy online to have latest designer inspired creation to end up in boy’s wardrobes, the look is simply remarkable with G3+ Fashion Boys Coat Suits in exclusive designs which we have brought from our 29 years of offline store G3+ experience and now online store availing to get wide range of options. 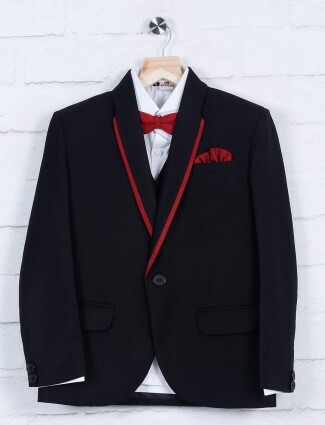 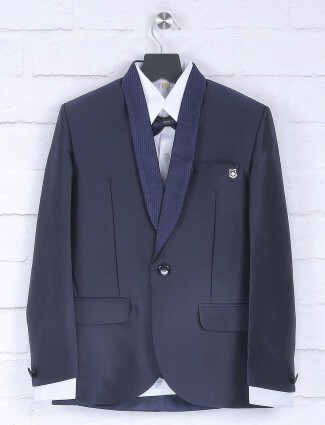 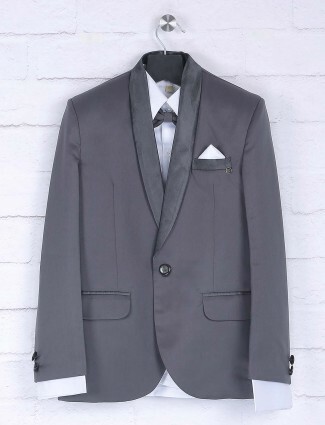 Choose the best coat suit for boys with our options of elegant styles for boys of all ages from 1 to 16 years from the best online portal g3fashion.com best all around Mumbai, Delhi, Pune, Chennai, Bangalore, Surat, Ahmedabad, Hyderabad and other. 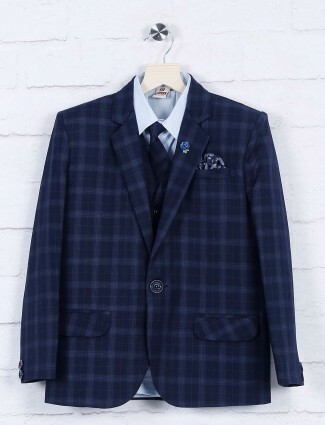 G3+ Goes Live is a service which brings live video shopping comforts to customers located in outer boundaries, meeting their satisfaction of shopping and viewing desired collection and all possible product view.